The pressure transmitter market was valued at USD 2.64 billion in 2017 and is expected to reach USD 3.36 billion by 2024, at a CAGR of 3.59% from 2018 to 2024. The growth of this market is attributed to the high emphasis on industrial automation and optimum utilization of resources. The base year considered for the study is 2017, and the forecast period considered is from 2018 to 2024. The report provides detailed information regarding the major factors influencing market growth. Monitoring and maintaining process parameters at suitable levels is extremely critical in industrial automation and process control. Industrial automation reduces the operational cost, improves product quality, increases productivity, and addresses industrial health- and safety-related issues across various process industries. Both discrete and process industries have increased their focus to bring in best practices to reduce wastage and increase plant efficiency. The way ahead for increasing efficiency and optimizing manufacturing processes lies in utilizing the factory floor data, such as real-time production data, to make better business and operational decisions. There is an increasing focus on incorporating systems and software that could make this job easier. This research study involves the use of secondary sources, such as encyclopedias, directories, and databases (OneSource and Factiva) to identify and collect information useful for the extensive technical, market-oriented, and commercial study of the pressure transmitter market. Primary sources, such as experts from related industries and suppliers, have been interviewed to obtain and verify critical information, as well as assess prospects. 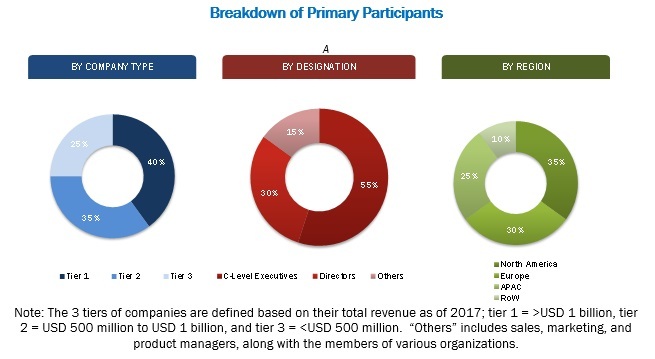 Key players in the pressure transmitter market have been identified through secondary research, and their market rankings have been determined through primary and secondary research. This research includes the study of annual reports of top market players and interviews with key opinion leaders, such as CEOs, directors, and marketing personnel. As of 2017, Emerson (US), ABB (Switzerland), Siemens (Germany), General Electric (US), Schneider (France), Endress+Hauser (Switzerland), Yokogawa (Japan), Honeywell (US), WIKA (Germany), and Dwyer (US) were the major players in the pressure transmitter market. Other players in the pressure transmitter market include Fuji Electric (Japan), Hitachi (Japan), Azbil Corporation (Japan), Krohne (Germany), Vega (Germany), Jumo (Germany), Brooks Instrument (US), BD Sensors (Germany), Setra (US), Omega Engineering (UK), Aplisens (Poland), and Ashcroft (US). In March 2018, Schneider Electric opened its new headquarters in Singapore for East Asia and Japan. To deepen its R&D capabilities and expertise, the company established its first large-scale innovation hub in Singapore. This innovation hub is focused on the enhancement and connectivity of measurement instruments. In June 2017, Emerson Automation Solutions signed an agreement with Saudi Aramco’s operations for digital transformation. The agreement includes the utilization of technologies offered by the company such as IIOT, and wireless and smart instrumentation. In May 2017, Yokogawa extended its DPharp EJA series of differential pressure transmitters with the development of the EJAC60E hygienic adapter system.. In this report, the overall pressure transmitter market has been segmented on the basis of type, fluid type, application, industry, and geography. What are the strategies followed by pressure transmitter manufacturers to stay ahead of the competition in the pressure transmitter market? In which industries, pressure transmitters are used widely? A pressure transmitter is an important part of the field instrument that determines pressure, level, and flow of a fluid across various applications in process industries. The pressure transmitter market is expected to reach USD 3.36 billion by 2024 from USD 2.72 billion in 2018, at a CAGR of 3.59%. The growth of this market can be attributed to the high emphasis on industrial automation and optimum utilization of resources. Differential pressure transmitters are likely to hold the largest share of the pressure transmitter market during the forecast period. The differential pressure transmitter is widely used in the measurement of pressure, level, and flow of a fluid. Differential pressure transmitters are widely employed in the oil & gas, chemicals, power, water & wastewater, pharmaceuticals, metals & mining, pulp & paper, food & beverages industries, among others. Differential pressure transmitters are used for petroleum flow metering in onshore, offshore, and subsea applications, monitoring filters in water treatment plants, and sensing heating systems remotely for steam or hot water. Level measurement application is likely to account for the largest share of the pressure transmitter market during the forecast period. In level measurement, the differential pressure transmitter can be easily mounted to the surface of the vessel for which level needs be measured. Level measurement carried out using the pressure transmitter is reliable, robust, simple to install, and uninfluenced by disruptive factors such as dust, foam, vapor build-up, and contaminants. Pressure transmitters are widely used in liquid-type fluid measurement. The use of pressure transmitters in the oil & gas industry can be observed in controlling hydraulic pressure drilling, ensuring rig safety, measuring flow line pressure, and subsea injection valves. Gauge and differential pressure transmitters are widely used to measure the hydrostatic (pressure exerted at rest) level of liquids in tanks and used for water level measurement of groundwater pumps. The water and wastewater industry is expected to witness the highest growth rate during the forecast period. Various kinds of pressure transmitters are deployed in the inlet pumping station, pumping control, and sludge level measurement in a primary treatment. Differential pressure transmitters are used to calculate the mass flow and air during the water aeration process; they also play a role in tertiary treatment to measure head loss across filters. Among all regions, North America is expected to account for the largest share of the pressure transmitter market in 2018. Factors such as significant investments in the energy infrastructure to serve the growing demand for oil and gas, strong economy, established process industries, presence of world’s largest network of gas pipelines, and significant contribution toward the global annual electricity generation continue to fuel the growth of the pressure transmitter market in North America. 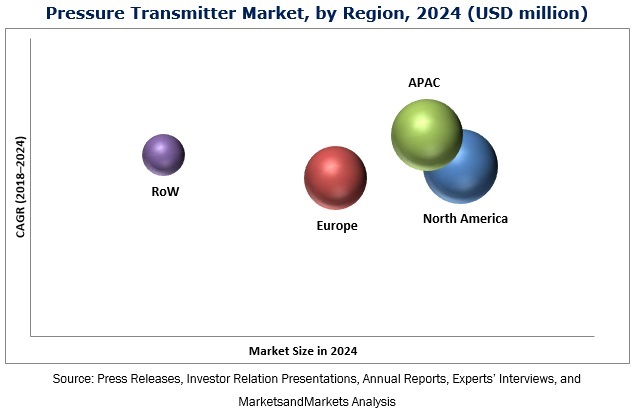 The fluctuating market trend in end-user industries is likely to hamper the growth of the market for pressure transmitters. Pressure transmitters are widely used across the oil & gas industry; hence, any event in the global petroleum market would affect the pressure transmitter market across the world. Fluctuations in crude oil prices will definitely impact the pressure transmitter market growth as pressure transmitters are widely installed in the oil & gas industry to measure process parameters such as the pressure, level, and flow. As of 2017, Emerson (US), Endress+Hauser (Switzerland), and Yokogawa (Japan) were the top players in the pressure transmitter market. These players have been focusing on product launches, expansions, and agreements. Other prominent players in the pressure transmitter market include ABB (Switzerland), Siemens (Germany), General Electric (US), Schneider (France), Honeywell (US), WIKA (Germany), and Dwyer (US). Which type of pressure transmitters would have the highest demand in the future? Pressure transmitters are most preferred for which applications? Which industry is expected to deploy most pressure transmitters to facilitate industry automation?